It took me a long time to come around before jumping on the Paleo bandwagon. And then once I did, it took me a longer time still to say the words about myself: I’d gone Paleo. Even now, writing this post, it’s hard seeing them in black and white, not gonna lie. You see, I’ve never been much of a fad follower when it comes to lifestyle habits like eating. And I get really turned off by all the hype around a trendy new diet – which is all I used to see Paleo as being. There’s all the books, magazines, shows, events… Diets are a billion dollar business and most end up being just a flash in the pan – you may see results in the short-term but eventually you end up going going back to the old habits and routine and you’re right back where you were months ago. I’ve always believed in balance, moderation, an abundance of good-for-you foods and no deprivation. That’s what works. Not a fad diet. Never mind the fact that I’m a health coach for crying out loud… I don’t do “diets”! That’s what my brain said anyway. But something else inside told me to look further and eventually I came to see that certain components of eating Paleo could really help me. One day a little over a year ago, I was home working on the couch because I was too stiff with joint pain to make it into the office and I caught an episode of Dr. Oz. He was interviewing a young girl who had gone Paleo as part of a treatment protocol for an autoimmune condition. She’d removed all grains, beans and legumes among other common inflammatory foods such as dairy and sugar and after a few months eating mostly vegetables and high quality animal protein she was living without pain and medications. With a little research, I found several other stories of healing while following a Paleo lifestyle. So, I hopped on and decided to try it for myself. I had already cut out common allergenic and inflammatory foods like gluten, dairy, soy and corn, but up until then I regularly ate grains and beans and even though I wasn’t strictly vegetarian, I ate very little animal protein. So I traded my quinoa and chickpeas for grass-fed beef and bison, and of course continued to load up on a crazy amount of vegetables. Within weeks I noticed a difference in my stiffness and energy level. And as I’ve stayed on the diet, I’ve felt better and better. If you’re saying to yourself now, “But I thought quinoa was healthy? !” You’re right it is. It’s not that these foods the Paleo diet eliminates are inherently unhealthy. When properly prepared and if you can tolerate them they can be extremely healthy for you. The problem is grains, beans and legumes can be particularly difficult to digest and rob the body of key nutrients like zinc. These foods have proteins called lectins and other anti-nutrients that help to preserve the plant and protect it from insects, molds, funguses out there in the wild. The lectins in the grain are like poison to whatever may threaten the life of the plant. To the plant though, we may as well be an insect. It’s poison affects us the same way, potentially depleting key nutrients we require for optimal health and immune function. This is one of the reasons why many with autoimmune and inflammatory conditions, myself included, have had such success removing these foods from the diet. The other thing to remember with Paleo, is the emphasis is really more on the vegetables than on the meat. I often see it the other way around so you want to make sure you’re filling your plate with high fiber vegetables like dark leafy greens and crucifers such as broccoli, cabbage and cauliflower. The fiber helps keep things moving through the digestive tract (if you know what I mean) so you minimize the amount of time you have beef hanging out in your gut. High quality, organic, grass-fed animal protein is an efficient way to get key nutrients but the key is to keep it moving, you don’t want it sitting around for a few days in your intestine. That can just get downright unpleasant. In hindsight, I don’t really know how I could have objected to a way of eating where you get to eat steak and all the vegetables you want. That’s not to say that I won’t go back to eating grains, beans and legumes one day. But when I do I’ll have this experience to help me be aware of how these foods affect my body. Even though for a long time my mind rejected the idea of “Paleo,” a little voice inside me told me there might be something there worth pursuing. I suppose we all have to come around to taking the step that we know is best for us, but that for whatever reason our minds tell us is pointless or silly or not worth the effort. Sometimes we just have to politely tell our mind to shut up so we can hear that tiny little voice inside that’s so easy to ignore. It’s usually much smarter than our brain and it seldom leads us wrong. If you’re intrigued about Paleo or if you have any questions about the diet or how it can be used as part of a protocol for autoimmune or inflammatory conditions, I’d love to talk more about it with you. You can email me at megan@meganadamsbrown.com. A few posts ago I introduced my new No Pain, Everything to Gain: 90 Days to the Real You. Note: This is not a Paleo diet program. No Pain, Everything to Gain is designed to help you heal and recover from chronic issues such as joint pain, muscle aches, allergies, asthma, headaches, rashes, etc. Through the program you’ll make shifts in your diet and lifestyle to take control of your health so you can feel better and get back to living life on your terms. I have three free 30 minute strategy sessions open this week. If you think trying something new might be just what you need, schedule your free 30 minute session here. Place stew meat in a bowl and sprinkle with arrowroot, salt and pepper and toss to coat. In a large skillet, heat olive oil over medium heat. Cook the beef until browned on one side, about 1-2 minutes and transfer to a plate. Add broccoli, white part of scallions, ginger, and 3/4 cup of water to the skillet. 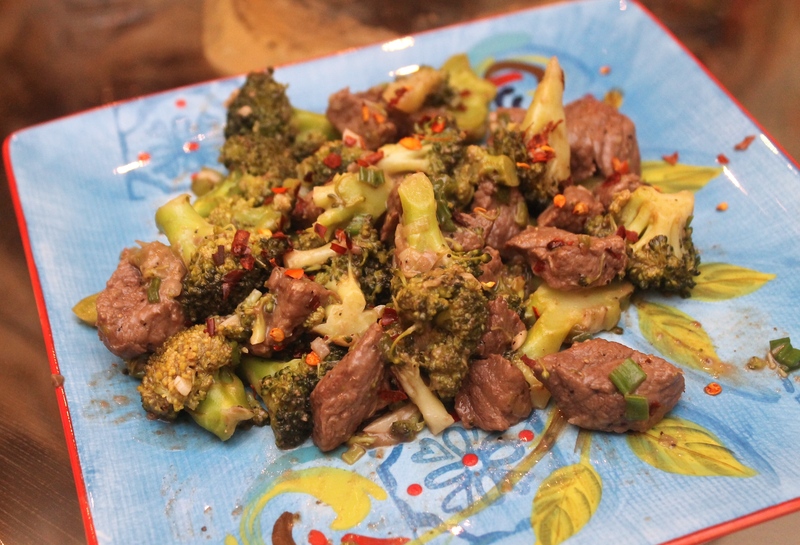 Season with salt and pepper and cook until broccoli turns bright green and begins to soften. Add beef back to the pan and cook until meat is cooked through, 2-3 minutes. Remove from heat and mix in green part of scallions and lemon juice. Serve with a sprinkle of red pepper flakes if you like a kick. Made this for dinner tonight and it was great! Very easy!